The condition of the land in the Northwest appears to be inadequate to support large populations. 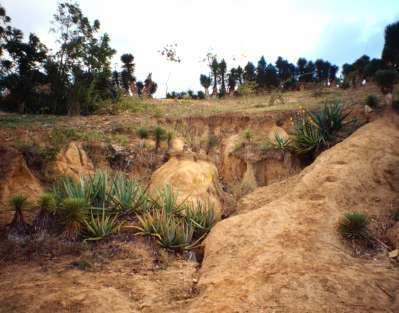 The vast majority of the vegetation in some areas consists of desert plants. Cactus and other thorned plants cover much of the hillsides and make it very dangerous to go more then a few feet inwards from the roads. I noticed common planting of Euphorbia as a living fence, and I wonder about danger of escape of this or other exotic species into native areas. A certain percent of the population is involved with what seem fairly desperate efforts, the making of charcoal from almost every source of wood, including cactuses. 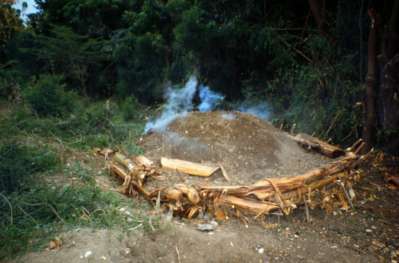 Besides the ravages of goats, it is generally held that charcoal making is one of the main contributors to deforestation. Family sizes are large, so overpopulation will continue to push people out of the Northwest to overcrowded Port-au-Prince and to less desirable land which is more fragile. The farmers are very aware of what their needs are, for technical help with seeds, water, soil conservation, and animal health. Unfortunately, many goats run wild, although most are tethered to small, unimproved paddocks or just along the side of the road. People are extremely motivated to adopt new technology. Most agricultural labor in Northwest Haiti is entirely by hand. Even the use of donkeys or cattle to pull plow equipment must be rare, because I only saw people hoeing by hand. In another area, the very productive rice area in the low lying L'estere north of Port-au-Prince, farmers were leveling the mud in rice fields by hand. Farmers in the Northwest are very skillful and patient in their use of the hoe and machete to do just about everything, and it was obvious that they took much pride in the quality of their farm work. 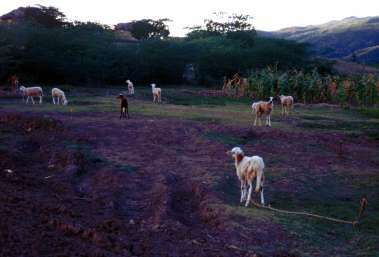 Production of animals, mainly goats and cattle, has four problems in Northwest Haiti: water, grass, diseases, and breeds. Apparently farmers do not adequately appreciate that even goats need a certain amount of water to survive. Cisterns may be the passive solution to provide water to animals. There is not much good quality grass for the goats to eat. They suffer from nematode problems. It is difficult to maintain pharmaceuticals and other medicines because of the general lack of electricity. An example is the Newcastle's disease of chickens, chronic from December through March, for which $10 of vaccine could save $500 worth of chickens. There is an opportunity to improve the breeds of animals, because reproduction is poor. The central part of Haiti has better breeds of goats. The farmer's main concerns were the need for seeds and cuttings of mango and avocado varieties, irrigation, animal production, and erosion control. They were interested in replanting mahoganies and "Guape" (pine?). Their main crops are corn, beans, and sorghum.